Winter salads are entirely different than summer salads. 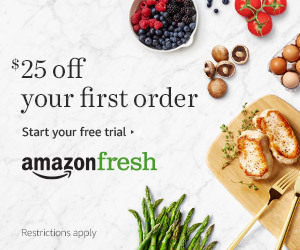 In mid-winter, root vegetables, bright citrus fruits, and dark greens are far more commonplace than light summer herbs and fresh, local berries. For salad eaters this means changing up the typical dinner salad to be more vegetable heavy with fewer light leafy greens. I happen to love doing this and am a big fan of winter salad making. In fact, sometime I make them hearty enough that the salad itself becomes dinner! Here are some of our favorite winter salads that are positively delicious and are healthy to boot. Roasted beets and bright oranges bring a little sunshine and health on a cold winter's day! Make beet and orange salad. This fresh chicken salad is studded with fresh berries and almonds, making it hearty enough for a meal! 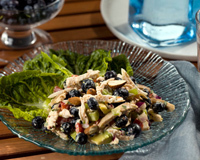 Make blueberry chicken salad with almonds. 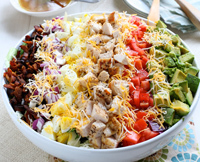 A Cobb salad is great year-round and is especially good for winter when we eat heartier foods. Pineapple winter salad is bound to bring cheer to your palate with all of its bright festive flavors. This healthy, light salad is packed with bright citrus and intense fennel, the perfect flavors to beat the winter blues. Make fennel and orange salad. Click here for more Delicious and Healthy Winter Salads.